First appearing on television in 2004, this popular pre-school series, featured the energetic Peppa Pig and her younger brother George "Roar Dinosaur". The animation takes us through the trials and tribulations discovered by Peppa whilst at home, school or visiting others. It has become so popular that merchandise includes plush character toys, clothing, bedding and play sets, plus more. 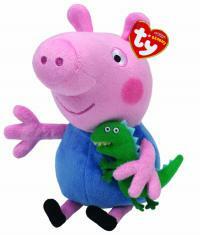 Peppa Pig and her brother George have become big stars in the pre-school world, now they are reaching back even earlier, with these gorgeously tactile, baby comforters, with sensory ribbon, embroidery and applique details.